If you're considering getting an outdoor dog kennel, there are many options to consider. Every dog could use a bit of fresh air and sunshine, but it's not usually a good idea to turn your dog loose outside unless you can assure his safety. 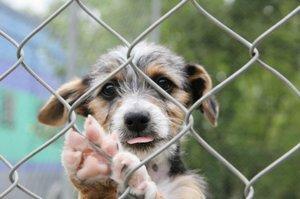 Fences provide a measure of protection for dogs by keeping them from running freely. The problem is the average four-foot-tall fence may not always be enough to keep more athletic dogs from climbing or jumping over and escaping the yard. Additionally, gaps at the bottom of the fence leave opportunities for dogs to dig their way out. An outside dog kennel can be a good solution when average fencing just isn't doing the job. Let's talk about the options available. Portable kennels are temporary set ups you can use in your own backyard or take with you when you and your dog travel. These enclosures are generally made up of six to eight wire panels connected by hinges. They conveniently fold open to create an exercise corral for your pet and fold down just as easily when it's time to move on. Portable kennels come in various heights to accommodate small, medium and large dogs; and some models are designed to connect two or more sets together to increase the square footage available for your pet(s). Most models include a panel gate as well. This type of outdoor dog kennel has a few distinct advantages; the most obvious one being the ability to take it anywhere with you. Another advantage is being able to move the enclosure to a fresh area anytime you choose. This eliminates the need to deal with permanent kennel flooring and helps keep bare spots from forming on the lawn. Clean up is also easier with a portable dog kennel. A bucket of soapy water, a scrub brush and a hose are all you need to remove mud and other debris from the wire surface. Permanent dog kennels require actual construction, and are made from much heavier materials than portable enclosures.The standard permanent kennel run is made from chain link fencing attached to sturdy steel poles that are sunk into the ground with cement footings. One panel includes a latching gate so both you and your dog can go in and out. In addition to walls and floors, many outside dog runs have some sort of roof to keep the worst of the weather off your pet, although providing an attached dog house is a very good idea. There are both advantages and disadvantages to permanent dog runs. On the plus side, these enclosures offer the most security for your dog with their sturdy construction. Portable kennels are always susceptible to getting knocked over by an overly excited dog. On the minus side, it takes a lot more work to keep a permanent kennel in good condition. Concrete slabs must be scrubbed periodically to remove the odor of soaked in urine, and other types of flooring must be replaced or removed to clean up droppings that wind up below the surface. Once you choose a style of outdoor dog kennel, the next step is deciding where to place it. Although portable kennels can technically be placed anywhere, here are a couple of tips to guide your choices. Avoid low areas in your lawn where rainwater will collect and make the ground soggy. Drainage is even more important when there is no flooring. Choose areas in your yard that offer at least partial shade from the sun so your dog will be less susceptible to overheating. The previous tips also apply to permanent kennels, but here are some additional tips for their placement. Avoid putting the kennel run close to your home unless you want to smell every smell and hear every bark. If you want to preserve good will with your neighbors, don't place the kennel adjacent to a shared property line. Also avoid placing the kennel directly beneath trees. Falling branches can damage the roof material and potentially injure your pet. Your local building and pet supply stores both likely sell a variety of dog kennels.